In its basic sense, a mattress topper is simply a thick pad that you place on the top of your mattress to add cushioning and support. The latter will allow you to sleep more comfortably, lessening the likelihood that you will wake up complaining about excruciating pain. Say goodbye to body pain because of your hard bed. Say hello to a more comfortable sleep by using one of the products that we will briefly review in this section of this guide. Comfort – this is one of the reasons why this mattress topper is one of my personal favorites. It has a responsive active suspension, which is basically the one that is responsible for the reduction of the movement of the foam. With this, it can be an excellent choice for those who are sleeping with their partner who frequently moves. It is also worth noting that it is made with the use of certified flexible polyurethane foam. It has undergone strict quality control and independent tests. This proves that it has surpassed the global guidelines, providing you with an assurance of its quality. It comes with a 2.5-inch high-density foam combined with 1.5-inch memory foam. There is a polyester mesh cover, which makes it more comfortable. The cover is also zippered, making it easy to remove when you need to have it washed. Still not convinced to pick this memory foam topper? Well, you might have a change of mind after knowing that the manufacturer is offering a 5-year warranty, which is one of the most extensive within the product category. Do you know what it feels like to be sleeping on clouds? Well, sleeping in this bed will most probably give you the same feeling. It is soft and plush, making it the perfect solution for a hard bed. One of the reasons why this can provide utmost comfort is because of its construction and materials used. It combines two inches of fiber fill with two inches of gel memory foam. The latter is not your ordinary kind of memory foam as it offers the cooling technology. This regulates your body temperature, making you feel comfortable all throughout your sleep. 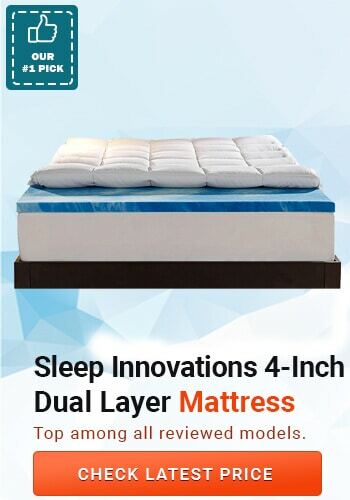 The pressure relieving foam that is used in this mattress topper guarantees your comfort. If you used to wake up with an aching body because of your hard bed, such is not one thing that you will experience with this. Toss and turns will be minimized, as well as the disruptions in your sleep. It is also a good thing that there is a removable and washable cover, which is made from 100% cotton. This is soft on the skin and will help to make your sleep more comfortable. Lastly, it comes with an industry-leading 10-year warranty. It is hard to find a product with a warranty as extensive as this. If there are any problems, as long as it is not your fault, get in touch with the manufacturer. If you are looking for an option that comes with a budget-friendly price, this should be on the top of your list. While it can deliver exceptional quality, it does not come with a hefty price tag. 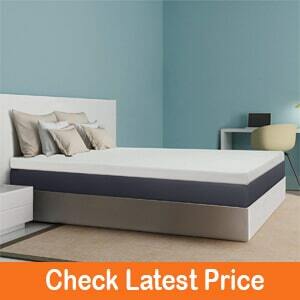 However, it is important to note that it is only two inches, which makes it thinner compared to the two mattress toppers that we have mentioned above. Looking at the features, one that I personally find impressive is the open cell structure. The latter is an innovative design that allows heat dissipation. It prevents heat from accumulating in one portion of the bed, and hence, guaranteeing your comfort. This mattress topper has impressive density rating. This is also the reason why it can be exceptional in terms of its ability to relieve pressure. Whether it is in your lower back, hip, or shoulders, among others, you will feel comfortable. The materials used are also notable because they are safe and non-toxic. They have been thoroughly evaluated to provide the assurance that they will deliver top-notch quality. This is an eco-friendly mattress topper. Lastly, you might also love the fact that the manufacturer is offering a 3-year limited warranty. On top of that, within a period of 60 days, if you are unhappy with the product, you can return it to the manufacturer, and they will issue an unconditional refund. Mattress toppers can be made from different materials, each with their own pros and cons. To start this guide, let us have a quick look at some of the most common materials that are available. This is perhaps the most popular. The ﻿foam is made from polyurethane, which has undergone chemical enhancements to achieve a specific density. They are known for the personalized support and cushioning that they can provide. They will bounce back when pressure is not applied. It is also effective in the reduction of motion for two people sleeping in one bed. However, there are instances wherein it can be hot, especially when the foam is too thick. To add, once it is taken out of its packaging, there will be a chemical-like odor. Lastly, it is also not budget-friendly. This is a material made from a liquid that is extracted from a rubber tree. Be sure to look for one that is made from natural and not synthetic latex. Aside from being durable, it adds softness to your hard bed to make it more comfortable. It also has a breathable surface to make you feel cool even during the hot season. One problem with latex, however, is that it can have a bouncy feel. There are also some who may develop an allergy to latex. 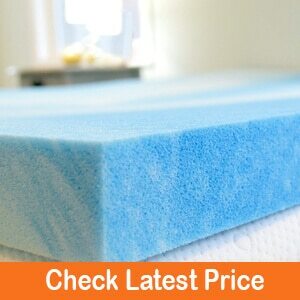 Like memory foam, latex mattress toppers can also be expensive. Lightweight and soft – these are two of the things that make feather an exceptional material for a mattress topper for your hard bed. Unlike solid foam, there are spaces between feathers, and hence, there is more air. It is also affordable, and it does not retain heat. Plus, they will make your bed feel luxurious. 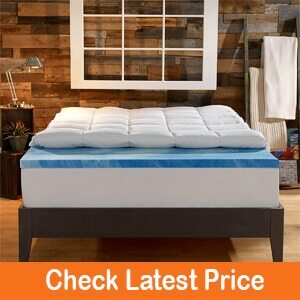 The best thing about wool mattress topper is that it is hypoallergenic. It has the natural capability to resist mold, mildew, and dust mites, among other allergens that can be common problems in the bedroom. It can also regulate the temperature of the body, whether it is summer or winter. Wool, however, is not easy to find. You will have a hard time looking for a mattress topper made from such material. When you find one, you might end up in frustration after knowing that it comes with an expensive price. Comfort: The best thing about a mattress topper is that it will provide you with a more comfortable sleep. A hard bed can put too much pressure on your back and will have a negative impact on your sleep. With a mattress topper, there will be fewer disruptions. No More Body Pain: Another good thing about mattress toppers is that they provide the cushioning that is needed by the body to be relieved in its pressure points. Back, shoulder and hip pain will be less likely. Protect your Mattress: Your mattress can be easily prone to wear and tear with your weight. The pressure applied to it will make it shrink. With a mattress topper, there is a sort of protective barrier between the mattress and your body. To determine the right size of the mattress topper to purchase, you need to think about how big is the bed where it will be used. Be sure that it is not smaller or bigger than the mattress of the bed where you will have it placed as a topper. Most of the options in the market will have a thickness that ranges from two to eight inches. The thinner the foam is, the less supportive it can be. If your mattress is already old, you need to have a thicker mattress. The same thing is true if you have a partner who moves a lot when sleeping. If your mattress topper is made from foam, density refers to the weight of one cubic foot of foam. Foams with higher density are better because of their ability to support heavier weight. They will also most likely stay firm through time, unlike low-density foams that can easily shrink. Choose a mattress topper that already comes with a cover, which will provide protection to the inner material. The cover should have a zipper and should be machine-washable. To add, it should be made from soft material, such as cotton, which will help to ensure your highest level of comfort in your sleep. Suffering from allergies can cause discomfort, especially because you will wake up in the middle of the night feeling bad. With this, choose a mattress topper hat can resist mold, mildew, and dust-mite. In this case, wool is great because it is hypoallergenic. If you want to be more comfortable, even during the hot season, see to it that the mattress topper will offer excellent ventilation. There should be space for air to circulate, and hence, regulating your body temperature. For memory foam, those with gel will help. 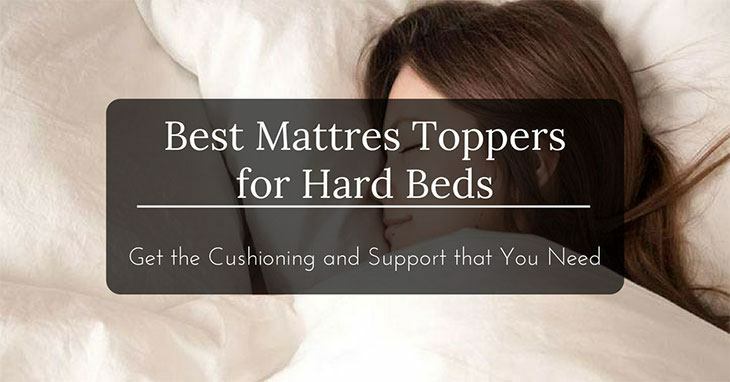 In sum, the best mattress toppers for hard beds can offer the perfect solution for a better sleep. This will provide a support and barrier between your body and the bed. It will also relieve pressure points, and hence, when you wake up in the morning, you will not experience body pain. From the five products that we have mentioned above, Advanced Sleep Solutions Gel Memory Foam Topper stands out from all others. It offers excellent heat dissipation for optimal comfort and air circulation. There are a three-year warranty and a 60-day money-back guarantee, which will ensure your highest level of satisfaction.